Getting a carwash is one of those tasks that I avoid until I absolutely need to get it done. Frankly, it’s not high up on the list of things I want to do when I have spare time on the weekend. Enter Cherry, a newly launched startup that brings on-demand carwashes to you and your car. The startup is also announcing $750,000 in seed funding from a number of ex-PayPal employees including Yammer CEO David Sacks, PayPal founder Max Levchin and Square COO Keith Rabois. The service replicates how disruptive taxi service Uber allows users to book cars. Using either a web or a iOS app (Android will be launching soon), users can specify the location of their car on a street (as well as what type of car, color and license plate number) in a parking lot, or another public area. 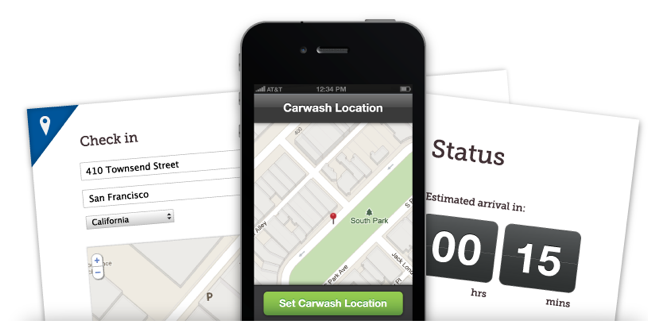 Once you check in with your car’s location on Cherry, the service’s technology immediately finds and dispatches a carwash professional to wash your car right where you left it, and you don’t even need to be there. Cherry, which is launching its service in San Francisco today, charges $29 for each carwash, which includes cleaning of the car’s exterior and an air freshener. Cherry auto-charges customers’ cards after each wash so they don’t need to meet the washer to pay. Customers rate their wash, which Cherry uses as a customer’s tip and pays washers a bonus for five-star washes. The $29 also includes an interior cleaning as well. This is a bit more complicated, as car owners either leave their doors unlocked or they come down to unlock when the washer arrives (Cherry will send owners a text message). Personally, I would never leave my door unlocked on the street or in a garage, but the company says most of the early users have opted to get interiors cleaned. The washer will lock the car up when they’re done. In terms of insurance, every customer is covered under Cherry’s guarantee, which covers any and all accidental damages to a customer’s car. Cherry’s co-founder Travis VanderZanden (a former Yammer exec) says that he and fellow founder Art Henry personally meet with, vets, trains and supplies equipment for every washer hired to wash for Cherry. And in case you are considered about the environmental impact of the car wash, Cherry uses an eco-friendly carwash solution that is 100% biodegradable. Their portable sprayers are designed to wash cars with significantly less water runoff than traditional carwashes. One caveat to Cherry’s business—your car needs to be parked in a fairly public space for the car washers to enter. Obviously, cars parked on the street are accesible for the service’s washers, but if you have a private garage, Cherry may not work for you. That being said, Cherry has been able to work with some parking lots for employers to gain entry. For example, The service has been used by a number of Square’s employees in the mobile payments parking lot, and Cherry has been able to work with the lot to gain access to employee cars. Similar to Airbnb, Uber, and GetAround, Cherry is a business that is making our lives in the real world better using data, location and mobile technologies. The service is already getting some rave reviews, which you can check out here.